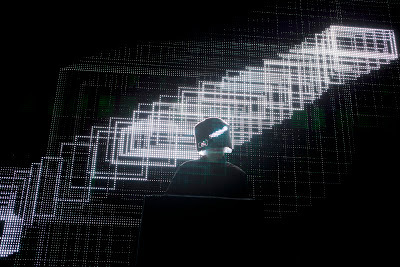 Squarepusher dispels any Misconceptions about him or his latest album, Ufabulum. Tom Jenkinson is troubled. The experimental electronic producer and self-described “hard-baked, self-taught” musician Squarepusher, he’s bothered by the dominant opinion that his latest record, last May’s Ufabulum, is a return to form. Not only does Jenkinson not hear it that way, he feels that perception points to larger problems with music criticism in the Internet age. Whatever the cause, respected music outlets like Drowned in Sound, Pitchfork and XLR8R have described the album in similar terms: if not a return to form, then a return to an earlier—and seemingly preferred—chapter in his 18-year career. “In a very superficial way, it has some of the same tempos, and the drum rhythms are to some extent similar, but to me it doesn’t sound anything like an old record of mine,” Jenkinson concludes. Ufabulum maintains Jenkinson’s jazz spirit while showcasing his electronic experimentalism, and it does both with great bombast. Songs like “4001” and “Dark Steering” are stadium-size in their twisted drumming and big-beat-era grandiosity, while “Energy Wizard” and “Stadium Ice” are as 8-bit as they are electro-jazz-funk. For critics, there’s a refreshing familiarity; for the artist, there’s distinct growth sonically. For both, there’s also significant growth visually.